1/8th Bn, The Worcestershire Regiment, 144h Infantry Brigade, 48th Division, T.F., B.E.F. 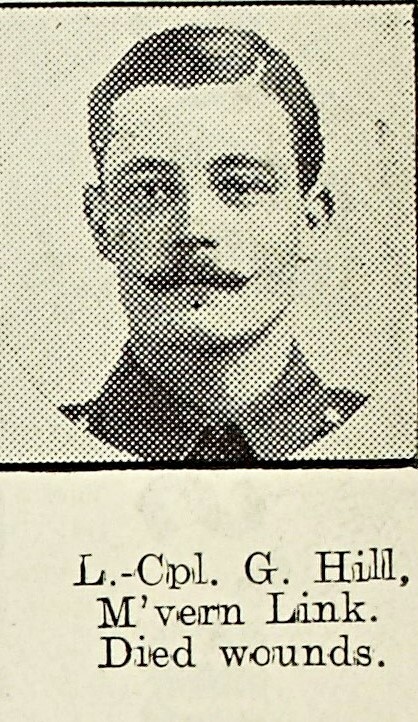 George Hill, was a pre-war member of Malvern’s C Coy, 8th Worcesters (which merged with D (Evesham) Company to form the new B Coy in 1914), enlisting at Malvern. 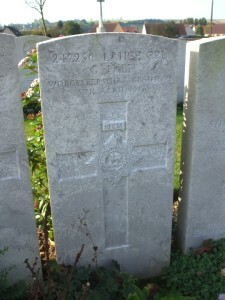 He landed in France with the rest of the Battalion in April 1915, and was wounded in the Hebuterne trenches early in 1916. He was transferred to England, and on recovery was posted to the 2/7th Battalion, and served overseas with this unit (who landed in France for the first time in May 1916). In September of that year he found himself posted back to his old Battalion – the 1/8th – possibly due to being wounded once more, but needed as the Battalion had suffered so heavily from gas casualties in July. He was present at fighting on the Somme around Le Sars and the Butte de Warlencourt in December and at the end of January he will have moved south to take over French trenches near Peronne. Hill was mortally wounded in a successful attack against German positions at Templeux-le-Guerard. Read more about the German retreat to the Hindenburg Line.